1. We preach the God of eternal existence. The Scripture says, "in the beginning God." When Moses came to the burning bush, God said, "Go down and deliver my people out of Egypt." Moses said, "whom shall I say hath sent me?" and God replied, "I AM." Not, I was; not I shall be, but I AM, the eternal I AM, the everlasting I Am. I Am that I Am! 2. . We preach the God of creation. "All things were made by him and without him was not anything made that was made." In him we move, we live and we have our being. God created all things. 3. . We preach the God of sovereign mercy. The Scripture says "Noah found grace in the eyes of the Lord." The Bible says, "I will have mercy upon whom I will have mercy; I will be gracious to whom I will be gracious." We preach the God of mercy, yes, but sovereign mercy, the God of grace, yes, but sovereign grace. God will be gracious to whom he will be gracious. He owes no man anything; if he bestows grace, his mercy, it is sovereignly bestowed. He is an immutable sovereign, and unchanging sovereign. 4. . We preach the God of righteousness. Our Lord said, "I will in no wise clear the guilty. The soul that sinneth it shall die. Sin when it is finished bringeth forth death." God Almighty is a righteous God. He is a holy God, therefore, Christ Jesus came into the world that God might be just and justify the ungodly. We preach a God that cannot show his love at the expense of his holiness. We preach a God that cannot show mercy at the expense of his truth and only at Calvary can mercy and truth meet together, and righteousness and peace kiss one another. The God we preach is the God of righteousness. 5. . He's the God of unchanging grace. "I am the Lord," he said, "I do not change; therefore, you sons of Jacob are not consumed "Why is there no fear of God before the eyes of this generation? They've heard preached a false god; they've heard preached a weak god; they've heard preached a failing god; they've heard preached a disappointed god; they've heard preached a god whose hands are tied; they've heard preached a god who says I have no eyes but your eyes; I have no feet but your feet; I have no hands but your hands. That's a lie! The God of the Bible is totally and completely independent of his creatures as far as his strength, his wisdom, his power, his beauty and his glory are concerned. We do not add to his glory! We receive and share in his glory. The God we preach is the God of eternal existence, the God of creation, the God of sovereign mercy, the God of righteousness, and the God of unchanging grace. He is the God upon whom we depend; the God to whom we look; and the God without whom we can't exist! All things that we have we receive of him. We return nothing but that which he gives us. What is it to preach the Gospel? It is to preach the truth about God. Secondly, what is it to preach the Gospel? It's to preach the truth about man. Men do not want to hear the truth about God; and they do not want to hear the truth about themselves. But Gospel preachers preach the truth, not only about God, but the truth about the sinner, and they leave that sinner empty, broken and destroyed with all his foundations of flesh swept from under him, and all his self-righteous rags stripped from off him, leaving him naked and unclothed before the searchlight of God's holiness. What does the Bible say about man? It says in Romans 3:10, "there is none righteous, no not one, there is none that understandeth; there is none that seek after God." What are men seeking? Seeking their own pleasure; seeking their own comfort; seeking their own glory; seeking their own wills; seeking their own satisfaction, everybody seeks his own, they do not seek God. "They are all gone out of the way, they are together become unprofitable, for there is none that doeth good, no, not one." Christ said, "you have not the love of God in you." Somebody says, "Well, I love people." No you don't. You just consider whom you love. You love yourself. You try and think this minute “is there anybody in this world you really love? Well, you say, "I love my wife," that's yourself. That's your wife. Well, "I love my mother and father." That's still loving yourself! You love them because they are your mother and father. Well, "I love my son or daughter." Your son and daughter! Do you love anybody else's son or daughter? "I love my brothers and sisters" That's yourself. Well, "I love my Saviour; my own personal Saviour." That's loving yourself. If He weren't your Saviour, you would not love Him. Everything you love is connected with your own sinful, selfish self. Your whole world revolves around yourself, your own pleasures, your own delights, your own passions, your own seeking. "There is none good, no, not one. Their throat is an open sepulchre, with their tongues they have used deceit the poison of snakes is under their lips; their mouths are full of cursing, bitterness, murmuring, complaining, fault-finding, gossip, back-biting, their feet are swift to shed blood, destruction and misery are in their ways, the way of peace, they know nothing about it." "When I saw the Lord, I said I have spoken once, yea, twice, but I'll never speak again." "When I saw the Lord, I fell at his feet as a dead man. My eyes have seen the Lord." "When I saw the Lord, I cried, woe is me, for I am a man of unclean lips, and I dwell among a people of unclean lips. When I saw the Lord I saw my guilt." "O, God, be merciful to me a sinner!" Thirdly: What is it to preach the Gospel? It is to tell the truth about God and man, and it is to tell the truth about Jesus Christ. My friends, Jesus of Nazareth is not a weak, frustrated reformer; Jesus Christ of Nazareth is very God of very God. He is the Messiah. He did not die as a martyr; he did not die as an example, he came down here and died on the cross as the victorious, conquering, successful Redeemer of his people. He died as the covenant Redeemer. He died for the covenant people; he died to accomplish a task given him by the Father before the world's creation. When he completed his suffering on Calvary, he said, "It is finished." He cannot fail! Christ is not a frustrated Redeemer; he is not a disappointed Saviour; he is not a defeated Saviour; he is not a poor, weak, reformer up there in heaven, crying his eyes out because people won't let him have his way. He is the conquering, victorious Messiah who is seated at the right hand of the Father, waiting until his enemies become his footstool! He is the Lord of the living and the dead. A preacher said to a congregation one time, "won't you make Jesus your Lord?" I emphatically declare that you cannot make Jesus Christ your Lord! The Father has already beaten you to it! He is your Lord! He is your Lord if you are saved; he is your Lord if you are damned! He is your Lord if you are on the right hand with his sheep; he is your Lord if you are on the left hand with the goats! He is your Lord! Every knee shall bow and every tongue confess in heaven, earth and hell that he is Lord. You don't make him Lord, you recognize him as Lord. God made him Lord. The Father has delivered all things to the Son; the Scripture says he is the Lord. He purchased that right through his death on Calvary. Jesus Christ is not a fire escape from hell, he is the Lord; he is not a doormat named Jesus, he is Lord. If any man shall confess with his mouth that Jesus is Lord, and believe in his heart that God has raised him from the dead, he shall be saved. His life is a perfect righteousness; his death a perfect sacrifice. We’d better start telling the truth about this man called Jesus. To preach the Gospel is to tell the truth about the Lord Jesus Christ. Fourthly: I am come to preach the Gospel and tell the truth about God, about men, about Christ and to tell the truth about salvation. Now let me tell you something about this thing of salvation. We use that word rather loosely in this day. Salvation from sin is not by the deeds of the law. Even those who are supposed to know something about salvation by grace have to remind themselves again and again that salvation is not by the works of the flesh, not in any way! Salvation is not by reformation; salvation does not come by decision; salvation does not come through church ordinances; salvation is not ours by church membership; salvation is in Christ the Lord. That's where salvation is, not in man's purpose, not in man's plan; it's in a Person. It's not in a proposition, it's not in walking an aisle, it's not in a church ordinance, it's in Christ! It's not in a law; it's not in the deeds of the flesh; salvation is in Christ. A man does not have salvation until he comes by the power of God's Spirit through faith to a living, personal, vital, intimate union with Christ as the Lord. A man is not a Christian until he has a vital union with Christ. A man is not a Christian until he is inseparably joined, personally joined to Jesus Christ. A man is not a Christian until Christ becomes his life. A man is not a Christian unless you can cut into his heart and find love for Christ; cut into his mind and find thoughts of Christ; and cut into his soul and find a panting after Christ. Christ in you, that's the hope of glory. The Holy Spirit convicts a man of sin; the Holy Spirit empties a sinner; the Holy Spirit brings a man to faith in the Son of God, faith in the living Lord. “If any man be in Christ, he is a new creature. Old things are passed away, behold, all things are become new.” Most people's so-called Christianity can be taken off with their Sunday clothes; but a man who is genuinely saved has Christ living in him as an everlasting fountain springing up into everlasting life, he's been born-again, he's been resurrected from the grave, he has the very image of the Son of God stamped on his heart and it cannot be moved. What is it to preach the Gospel? There are not many folks preaching the Gospel because there are not many people telling the truth about God. Everybody has a god. But eternal life is to know the living God. What is it to preach the Gospel? It's to tell the truth about man, and we are not going to like what we hear. It's to tell the truth about, Christ, and it's to tell the truth about salvation. "Who maketh thee to differ?" Are you able to preach? Who gave you the power? Do you have a little more than somebody else? Who gave it to you? Do you have more talents than the next fellow? Who made you to differ? "What hast thou that thou didst not receive? Now if you received it, why dost thou glory?" Why do you glory in your beauty? God gave it to you. Why do you glory in your strength? Without God you would not have it. Why do you glory in your wealth? God gave it to you. Why do you glory in your talent, in your singing ability? Without God's grace you'd be a simpleminded imbecile. Who made you to differ? What do you have that God didn't give you? If you are walking around with something, something somebody gave you, why are you bragging as if you have it of your own natural ability? Why do you think that you are better than anybody else? Only God's merciful grace; God's gracious grace enables you to be anything. Read the next line of our text: "Necessity is laid upon me." Why is it necessary for me to preach the Gospel? Preacher, why are you so compelled; why is it that every time you speak it's always Christ and him crucified the Gospel? I'll tell you why because of the truth and the beauty of the Gospel. I see in the Gospel of substitution a beauty beyond all things. I see in the Gospel of Jesus Christ the Good News of the Son of God, the truth of God. Only Christ can meet the perfect law. Only Christ can satisfy the justice of God. Only Christ can open the way for us into the holiest of all, into the presence of the Father. Only Christ can supply the need of the bankrupt sinner, and only Christ can keep me from falling. "Now unto him who is able to keep you from falling, and who is able to present you faultless before the throne and the presence of his glory with exceeding joy; to him be glory both now and forever." That's why it's necessary for me to preach the Gospel: the beauty of it, the glory of it, and the truth of it. I could tell you that salvation is in the church, but it wouldn't be true. I could tell you, let me baptize you, and by obeying the baptismal commandment you will go to heaven, but it wouldn't be so. I could tell you that if you live a good life and pray and go to church on Sunday and give a little offering, God will take you to heaven when you die, but it wouldn't be so. I could tell you to quit drinking, live a good, moral life and you will go to heaven when you die, but that would be a lie. But when I tell you that Christ died for our sins; that Christ is a sufficient Saviour; that Christ is an effectual substitute who came down here and gave us a righteousness which we didn't have and couldn't produce, went to the cross, bore our sins, paid our debt, satisfied the justice of God; that he is our living advocate at the right hand of the Father; and that if you come to a living, vital union with him, you'll be saved, that's the truth, and the only truth that will make you free. Paul said it first, the Holy Spirit inspired him to say it, "Woe is unto me if I preach not the Gospel." I'm in trouble, real trouble. I can't think of a crime more terrible than to be entrusted with the immortal souls of eternity-bound boys and girls, young people, men and women, like every preacher is entrusted every Sunday, and then stand up in church and waste precious time talking about myself, about my problems or my so-called denomination or my church, or talk about my ideas of what is right and what is wrong. I can't think of a more awful crime against society than to deceive people who are given to us to instruct in the things of the Lord. I've got to preach the Gospel! Woe is me if I don't. God have mercy, and he won't, if I don't! Woe unto the cities of Sodom and Gomorrah, woe unto the Christ-crucifiers of Jerusalem, but double woe upon the preachers and shepherds and pastors who for advantage, filthy lucre and praise of men deceive men's souls. God help them, but he won't. Woe is unto me if I preach not the Gospel, and there's not another one, it's the Gospel of Christ. If an angel from heaven preaches unto you any other gospel, Paul said, "Let him be accursed." I'm preaching as a dying man to dying men; I'm preaching as one who may never preach again, and under God I'm going to tell you the truth. I say this, woe is me if I preach not the Gospel; but I have something to tell you: woe is you if I preach it and you do not believe it. You may not understand it; and it may not fit in with your tradition; and it may not fit into your denominational pattern, and I'm sure if it's the Gospel it won't because Christ didn't fit the denominational pattern when he came down here either. He didn't fit into their religious theology; he didn't fit into their tradition; and he didn't fit into their mould; and they crucified him! Hi, Arevordi, how can I send you a message? My comment is just too long but very important. Thanks. Hello Arevordi, I very much like your other two blogs, "The rising of Russia" and "The Armenian Highlands". And your ideas and vision of Armenia go very much with mine. But this blog gives a wrong direction, because simply it's based on wrong or non-existent information. I'll put this analysis in the comments part by part as its rather long. You don't have to search the web long to find quite a few sites eager to tell you the great similarities between Mithraism and Christianity. These sites either imply or outright state that Christianity is a fraudulent creation based primarily on Pagan religion, and especially on Mithraism. There you will seelists, some quite long, of the things the two religions have in common. The only problem is that most of the items on these lists aren't true. What we have here is a garbage in, garbage out, situation. If the majority of your facts are wrong, your conclusion will also be wrong. In the comparison between Mithraism and Christianity, the situation is even worse. Even if every single item on these lists were true, it can still be proven that Christianity didn't take any of them from Mithraism. Before getting to the lists, I want to get one thing out of the way. But was it? Mithraism was a mystery cult, open only to men, popular primarily among soldiers and middle managers (Clauss, chapter 6), with no central organization. Right away we see a problem: membership was barred to half the population. Of the half that could join, only certain classes showed interest. And why not; did the average citizen of Rome have the leisure or the education to study for initiation in such a group? Further, it is hard to conceive of a religion made up of small, independent, secret groups ever becoming in any sense official. The relevance of this to whether Christianity took things from Mithraism is this: what would have been the point? The two religions weren't competing for the same converts until Christianity was fairly well established. Now to the lists. I'll give the list entries in italics, followed by my responses in ordinary print. This list is a composite of a number of those found on the web,many of which repeat the same points, making it impossible to determine the originator of any of them. "It was a custom of the Pagans to celebrate on the same 25 December the birthday of the sun. ... Accordingly, when the doctors of the Church perceived that the Christians had a leaning to this festival, they took counsel and resolved that the true Nativity should be solemnized on that day" (quote din Hutton, p. 1). December 25th was the birthday of the sun, then; to be specific, of Sol Invictus, the "Unconquered Sun." The complication here is over the question of whether Mithras and Sol Invictus are the same deity. Sometimes it seems that they are. There is an inscription from the first quarter of the second century CE, found in Rome, that refers to "Sol(i) M(ithrae)"(Clauss, p. 22). (Roman dedications commonly included abbreviations; that the"M" referred to Mithras is obvious because the inscription is on an image of him.) Further, Mithras is often called "Invictus," just like the sun. There are two problems here. First, "Invictus" was a title which was applied to gods other than Mithras and Sol. Hercules, for instance, was called that, as were even emperors (Clauss, p. 24). This particular title is therefore not significant. Even more telling, in the images we find in the Mithraic temples Sol is clearly separate from Mithras. He sends Mithras a message, invites him to heaven,shakes his hand, puts a crown on his head, and sits down at a meal with him.The best we can say, then, is that Mithras both was and wasn't the sun. Of course, the date of Christmas is not particularly important in the origins of Christianity, and has no bearing on Christian theology. It is worth noting,however, that the feast of the birthday of the sun, while definitely Pagan,wasn't pre-Christian. It was only established in 274 CE by the emperor Aurelian(Hutton, p. 1). Even more significant, the most important feast day of SolInvictus wasn't even on December 25th, but rather took place in October(Hutton, p. 2). All in all, then the idea that Christians took the date of Christmas from Mithraism is shaky at best, and insignificant to boot. He was attended at his birth by shepherds. In images of Mithras' birth from the rock he is sometimes accompanied by two small figures. The same figures appear flanking the images of Mithras killing the bull in the Mithraic temples, the most important cult image of Mithraism. They're dressed like Mithras, and usually one carries a torch pointing up and one pointing down. In no representations are they connected with sheep or with any tools of shepherding.There are some rare examples when other figures, such as Saturn or Oceanus are present, and a few show a snake as well. In short, there are never shepherds present. He was considered a great travelling teacher and master. The main event in the life of Mithras is the killing of a bull. 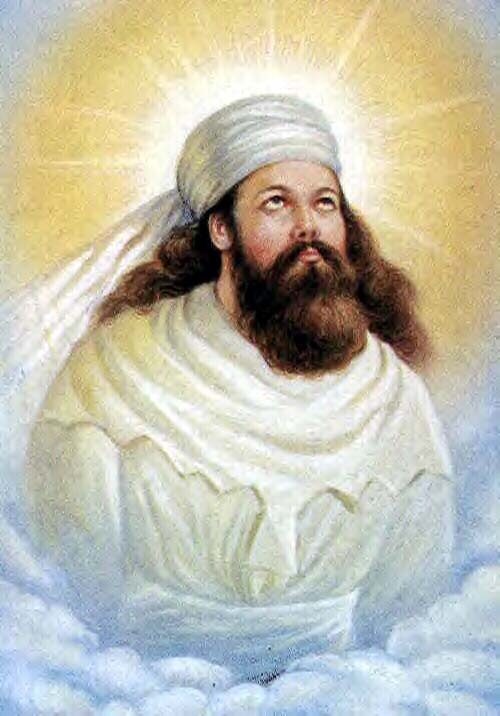 After this he ascends to heaven, so any travelling and teaching would have to have been done prior to the sacrifice. We have some representations of his life between his birth and thedeath of the bull. (Clauss dedicates chapter 8, "The Sacred Narrative," to these.) We know from these that he went hunting, he procured water by shooting an arrow at a rock, and he carried the bull to a cave. That's it. There was neither travelling nor teaching. Mithras had twelve followers. I've already mentioned the two torchbearers. 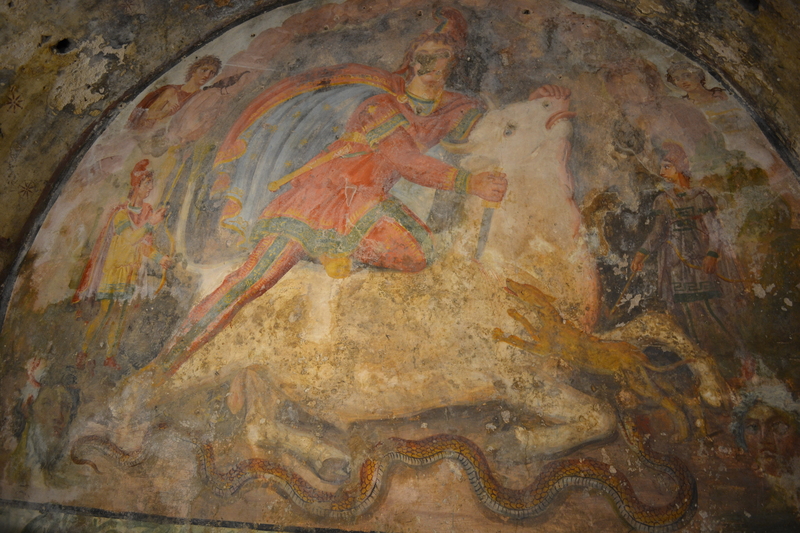 They are present in almost every image of Mithras killing the bull. Other figures can occur, some more frequently than others. The sun and the moon are very common,although they are clearly meant to be up in the heavens looking down at the death of the bull rather than accompanying Mithras. Oceanus and Saturn, whom I mentioned earlier as sometimes present at Mithras' birth, are also sometimes found in the tauroctony, although outside of the main scene. There are,however, no twelve companions. Perhaps this idea came from the fairly common representation of the circle of the zodiac surrounding Mithras and the bull.Whatever the source, the point is made moot, since as we have seen Mithras didn't travel or teach, so he would have had neither companions nor followers. He performed miracles. This one is actually partly right; we know of the one miracle of producing water from a rock. I can't seen any significance in this,though; how many major religious figures haven't performed miracles? He was killed and buried in a tomb. Sometimes we are even told that he was crucified. I am perplexed at how to respond to this. I suppose one way is say that no Mithraic scholar seems to be aware of any image, inscription, or text to this effect. If the makers of these lists know of one, I ask them to send the references to me and I will pass them on to the scholars. After three days he rose again. This is easily answered. Since he didn't die he couldn't have risen from the dead. He ascended into heaven. This is actually true. After killing the bull, he was raised into heaven by the Sun, usually on the Sun's chariot. Note the difference in theology between this and the ascension of Jesus, who ascends through his own power. The ascension of Mithras is a typical Pagan ascension to divinity. There is another important difference in this that cuts to the heart of the question of whether Mithraism is similar to Christianity. In Christianity Jesus ascends to heaven as a result of dying, but Mithras ascends as a result of killing. Once Mithras is in heaven, he and the Sun shake hands. They then sit down to feast on the meat of the bull. This means that the killing of the bull, the ascension, the handshake, and the feast follow one right after the other. This speaks to the question of Mithras' reputed death and resurrection. Since he killed the bull immediately before ascending, when was there time for him to die and be resurrected? This completes both the actual and the claimed story of the life of Mithras.Our lists also tell us about Mithras himself. He was called "the Way, the Truth, and the Light,""Redeemer," "Savior," "Messiah." As to the first three titles, I can only say that I have never encountered them. But then,since none of the lists give any references, it can't be said that any of their makers have encountered them either. If any of my readers are aware of any inscriptions or texts with these titles, please send them to me. "Redeemer" is a title which could not have been applied to Mithras for theological reasons. A redeemer must redeem from something. In Christian theology, this is seen as having been redeemed from sin. The word"redemption" implies a payment, and we see this in the words of St.Paul: "For ye are bought with a price" (1 Cor 6:20). This concept did not exist within Roman Paganism, so the term "Redeemer" would have been meaningless to Mithraists. Mithras was, however, called "Savior"("Soter"). To compare Mithraism and Christianity on this point is simply to note that they are both religions of salvation. This is an extremely underwhelming observation. I am perplexed as to why Mithras would have been called "Messiah," since that was a Jewish term that long predated contact between Rome and the Jews. Are people suggesting that Roman Mithraists introduced the word "Messiah" into Hebrew so that hundreds of years later it could be applied to Jesus? If indeed Mithras had been called"Messiah" (and I am unaware of any example of this), it could only mean that Mithraism had taken the term from Judaism or Christianity, rather than the other way round. Mithras was called the "Good Shepherd." Again I must first answer that if anyone has an inscription to this effect, please contact Mithraic scholars; they don't seem to know of it. It is worth noting as well that there is no pastoral imagery among Mithraic artifacts. He was identified with both the lion and the lamb. One more time, there are no sheep of any age in Mithraism. We do sometimes find lions, but as companions of Mithras, not forms of him. There is as well a deity found in Mithraic temples who has a lion's head. This is not Mithras, however. Mithras' resurrection was celebrated every year. Since, as we have seen,Mithras didn't die, and could therefore not have been resurrected, it would have been impossible for his resurrection to have been celebrated. This celebration was at Easter. This one is almost laughable. An impossible event was celebrated by Romans on a date determined by the Jewish calendar?Christians taking from the Romans a date they had already inherited from Judaism? The holy day of Mithraism was Sunday. We know nothing about when Mithraic rituals took place. Mithraism had a ritual meal. This is true. Mithraic temples were set up for this very purpose, and we are told by both Tertullian and Justin Martyr that Mithraists had ritual meals of bread and wine (or bread and water) (Clauss, pp.108 - 109). As Clauss writes, however, "In the case of these analogies,there can be no question of imitation in either direction. The offering of bread and wine is known in virtually all ancient cultures, and the meal as a means of binding the faithful together and uniting them to the deity was a feature common to many religions" (p. 109). In some lists, such as that given by Acharya S., this meal is referred to as a"Eucharist," or "Lord's Supper." This choice of words is clearly meant to assert a connection with Christianity simply by applying similar words. Those words are, however, highly inappropriate, since theypossess meanings that we don't find in Mithraism. "Eucharist" comes from a Greek word meaning, "grateful, thankful." There is no evidence of such an attitude in the Mithraic ritual meal. Its modern meaning implies some sort of presence of a deity in the food and drink consumed; again there is no evidence of this in Mithraism. In fact, since the meal of Mithras and Sol,which is surely the prototype of the Mithraic cult meal, has as its main element the meat of the bull, the cult meal could not have had the meaning of eating the god. "Lord's Supper" is equally loaded, since it implies a similarity with the Last Supper of Christianity. But the first supper eaten after an ascension which did not involve death is a very different thing from a last supper eaten before death. Of all the elements on this list, then, the significant ones aren't true, and the true ones aren't significant. Where these ideas originated is beyond me,but their repetition does no service to those who repeat them. I've perhaps been a little dishonest up to now. I've shown point by point how the supposed links between Mithraism and Christianity don't hold up. But even if they were all true, it wouldn't show that Christianity had taken anything from Mithraism, because that theory relies on an important assumption, that Mithraism predates Christianity. That seems obvious; Mithraism is Pagan, and Paganism is pre-Christian. This assumption is wrong. The Roman god Mithras has an ancestor in the Persian god Mithra. 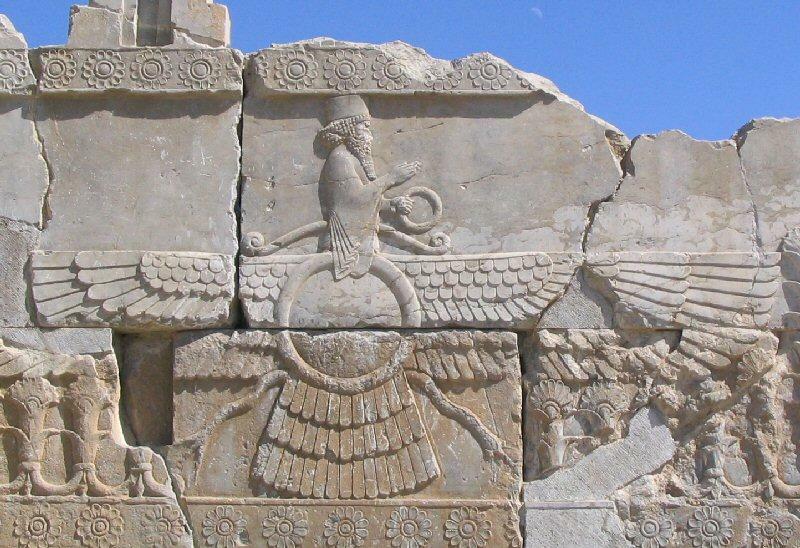 The worship of this Persian deity can be traced to at least 2000 BCE, and continues today.Mithra is a god of justice, truth, and light, and a helper in the battle against evil. Mithra and Mithras are not, however, the same deity, except in name. The exact nature of the connection between the two is still debated, but Clauss states the general attitude of Mithraic scholars quite succinctly: "We cannot account for Roman Mithras in terms borrowed from Persian Mitra" (p. 7).This is a position based on the fact that the defining characteristics of Roman Mithraism - small groups, initiations, masculine exclusivity, underground worship, the god killing a bull, astrological symbolism - aren't found in the Persian worship of Mithra. Roman Mithraism can therefore not be said to date back to 2000 BCE; it was a new religion that appears rather suddenly in the Roman empire. When did it appear? Here is a hard truth: the earliest Mithraic artifact is dated to about 90 CE (Clauss, p. 21). Let me repeat that date: 90 CE. This date doesn't require much comment. It shows something that may seem radical: any influence between Mithraism and Christianity would have had to have flowed from Christianity to Mithraism, rather than the other way round. Mithraismis not, in fact, a pre-Christian religion. In summary, the argument that Mithraism was a source for Christian beliefs or practices falls on three ground. First, there would have been no reason for Christianity to have taken anything from Mithraism. Second, the elements of Mithraism generally put forward as similar to Christianity are either untrue or insignificant. Third, and most deadly, Mithraism actually appears after Christianity. Thank you for reading, thank you for commenting. I have several pages in this blog. Please read them all. I am not an expert on Mithra or Mithraism. My primary intention with this blog is to reveal that Christ was NOT the awaited messiah of the Jews/Hebrews. Christ and Christianity have little if any similarities to Judaism. The fusion of the Jewish Torah with the Christian Gospels was a political move. Christianity, as we know it, is a result of Roman politics. 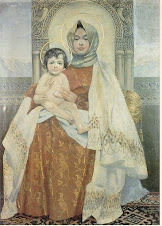 Christ/Christianity are the Levantine/Palestinian expressions of mysteries and theosophical values set in this world by Buddhism and Zoroastrianism. Btw, I never claimed December 25 was Christ's birthday. I don't even claim Christ was born on January 6. No one know when Christ was born. There were 2 religions in Israel at the time of Jesus - TALMUDIC JUDAISM and the TEACHINGS OF THE PROPHETS. Both Jesus and Jeremiah were indignant about the violence of sacrificial worship, not the possibility of petty theft by money-changers. 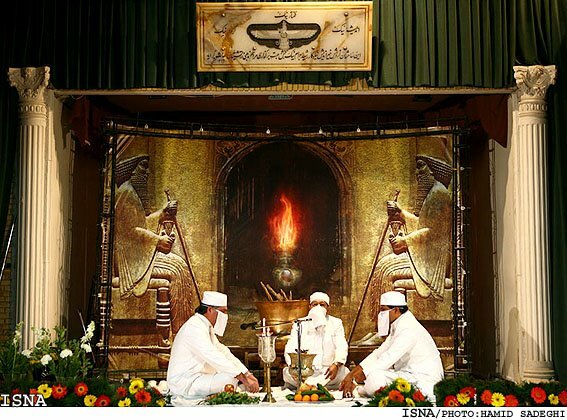 When they said God’s House had become a den of “robbers” the Hebrew word that was used (here, transliterated) was “per-eets’” defined as “violent, i.e., a tyrant–destroyer, ravenous, robber.” It was the violence of the system, the killing of innocent victims in the name of God, that they were condemning. The money changers operating in the time of Jesus were driven out of the Temple because they were taking part in the process of sacrificial religion, NOT because they may have been cheating the pilgrims. Open your Bible to the Book of Jeremiah, chapter 7 and read it all - not once, not twice, but trice! 21 Thus says the Lord of hosts, the God of Israel: “Add your burnt offerings to your sacrifices and eat meat. 22 FOR I DID NOT SPEAK TO YOUR FATHERS, OR COMMAND THEM IN THE DAY THAT I BROUGHT THEM OUT OF THE LAND OF EGYPT, CONCERNING BURNT OFFERINGS OR SACRIFICES. 24 YET THEY DID NOT OBEY OR INCLINE THEIR EAR, BUT FOLLOWED THE COUNCELS AND THE DICTATES OF THEIR EVIL HEARTS AND WENT BACKWARDS AND NOT FORWARD. 25 Since the day that your fathers came out of the land of Egypt UNTIL THIS DAY, I HAVE SENT TO YOU ALL MY SERVANTS THE PROPHETS, daily rising up early and sending them. 26 Yet they did not obey Me or incline their ear, but stiffened their neck. They did worse than their fathers. This is where the truth of what happened at the base of Mount Sinai has been covered up. You MUST read 1 Kings 11:1-11; Amos 5:21-27 ; Acts 7:42-43 and Sanhedrin 64a -64b to understand that HUMAN SACRIFICES were offered to Moloch aka the Gold Calf and that's why 3000 were put to the sword by Moses. 3. Is 'thou shalt not cause to pass' applicable only to a son who can naturally pass through himself, but not to a blind or sleeping son, who must be led or carried, or does it apply to all? 5. As two separate offences, proving that giving one's seed to Molech is not idolatry. The differences [sic] is, that if one sacrificed to Molech, or caused his son to pass through the fire to some other deity, he is not punished.